This post is sponsored by Cascade pure essentials – as always all thoughts & opinions are my own. 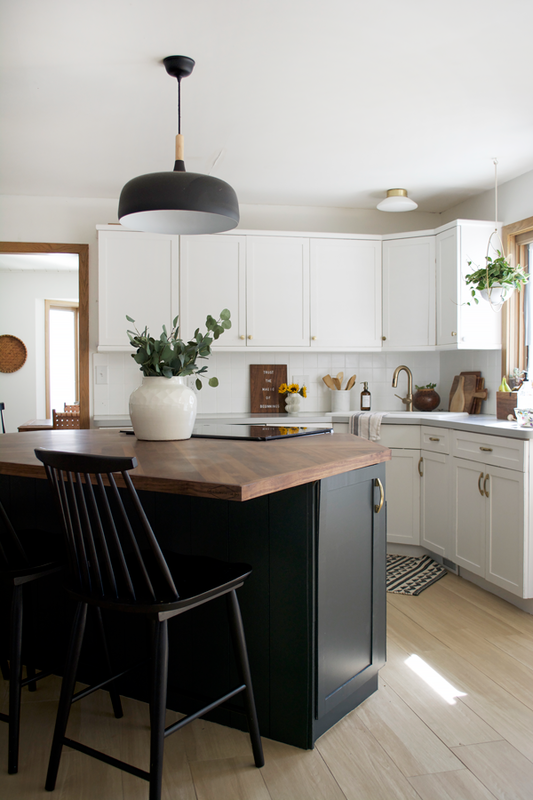 There’s no doubt that the kitchen is the space in our homes that we spend the most time in. If we aren’t there to eat, we’re there to cook, clean or just hang out. I know our kitchen island always ends up being the place everyone hangs out which I love. With all the time spent there, I’ve come to learn some kitchen hacks that have helped save me time and keep me sane – especially with two little ones running around! If you have kids and you have stainless steel appliances – the hand prints and finger prints probably drive you insane. I know they drive me insane. A quick and easy tip instead of getting out your cleaning supplies is to put a few drops of olive oil on a paper towel or cloth and wipe them right off. I’ll do this when I’m cooking dinner and already have the olive oil out so I can kill two birds with one stone! We’re big smoothie drinkers around here but I hate cleaning out our blender or NutriBullet. I feel like no matter what I always miss little nooks and crannies and leftover food gets stuck in there forever. It’s gross! An easy fix for this problem is to put some warm water and dish soap in your blender (I’ll quickly rinse it out first). Then blend it up and watch as all the food and little particles are removed quickly and easily! This is something I’ve been doing for a while now that all started back in our laundry room. 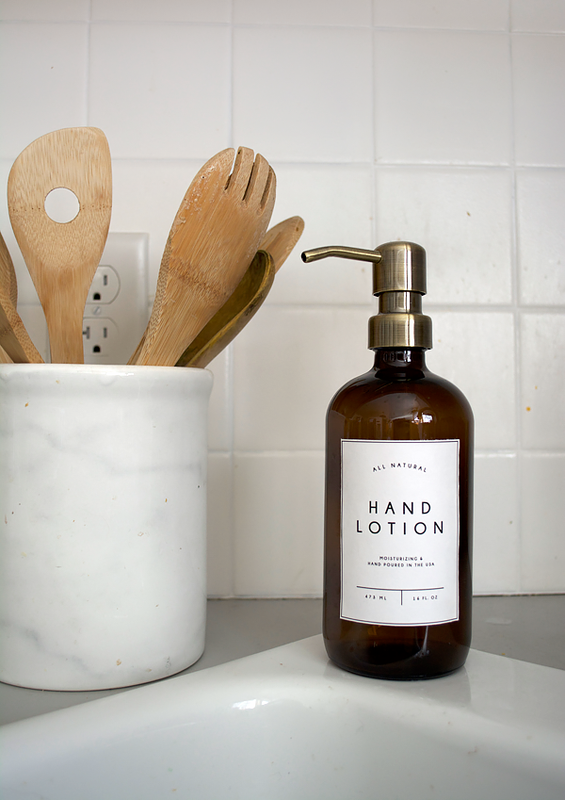 I have certain soaps and lotions I like to use but their packaging doesn’t necessarily compliment my kitchen aesthetic. So a quick fix to make them match the rest of my decor is to fill up a pretty amber bottle with my favorite soap and lotion and stick on a custom label I created. This way I get to use the products I love and they can blend in with the rest of my decor. 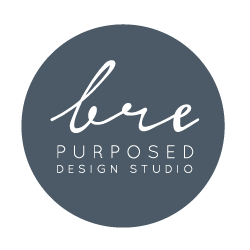 You can check out my post FREE LABELS FOR LAUNDRY ROOM PRODUCTS to print yours out! I know this sounds so simple and silly but it’s a serious game changer! I think we can all agree that cooking is way more fun than cleaning up. I’ve found that if I clean as I go, it makes it SO much easier and makes me so much happier once the meal is over. In between steps of making a meal, I’ll do a few dishes here and there and toss garbage away so by the end, our counters aren’t completely covered and the sink isn’t completely full of dirty dishes. Trust me – it makes such a big difference! The dishwasher is my best friend. Anything I can put in there I do and probably things that shouldn’t go in there end up in there too ha. With two messy kids and a messy husband I needed something that would keep our dishes looking sparkly clean after every use. 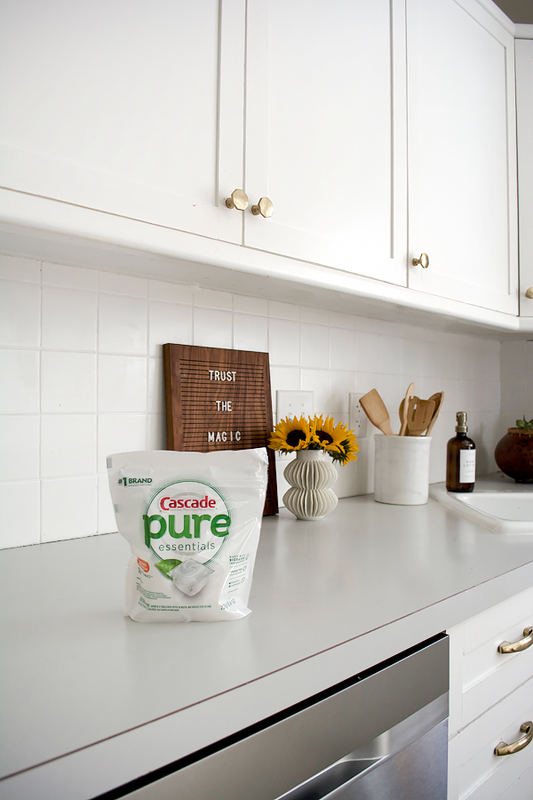 Cascade pure essentials ActionPacs have come to the rescue and are so powerful that I don’t even have to rinse our dishes before putting them in the dishwasher. And they’re made of 1/3 bio-based ingredients so it’s the perfect combination of performance and a product I can feel good about. It’s a total mom must have. I only recently started doing this and it’s been such a time saver for lunch and snack time. Plus it helps your veggies stay fresh longer. As soon as I get home from a trip to the grocery store, I’ll chop up any of the fresh veggies I bought like peppers and cucumbers and store them in a glass container. Then when it’s time for lunch I can just grab what I need and I don’t have to waste time cutting them. We switched out our old ugly black sink last year with a pretty new white porcelain one, and the dirt and grime definitely shows. It’s bound to happen with a white sink but one thing I do to keep it sparkly clean is to use a dish soap and baking soda mixture about once a week. 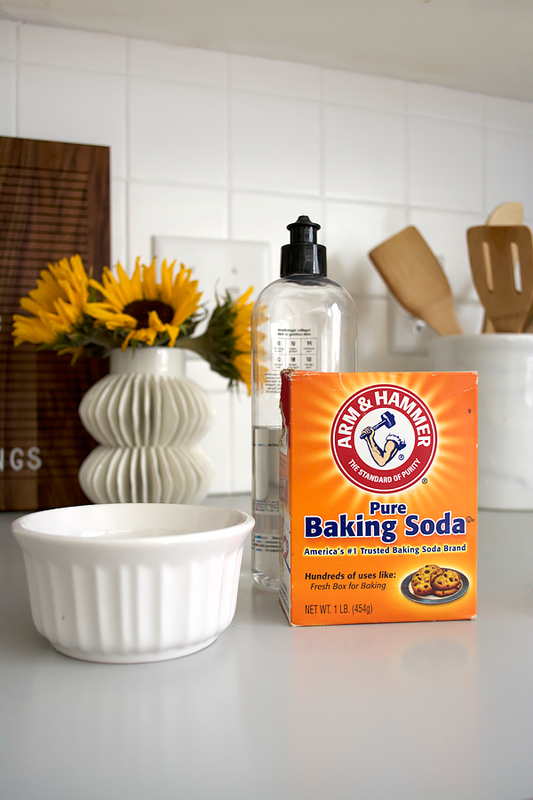 I use a couple scoops of baking soda + a squeeze of dish soap and mix it together in a little bowl. Then I just drizzle it all over our sink and wipe it around in circles with a cloth. It helps fight those tough stains and keeps my sink looking brand new. I have to say this is one of the best new services ever. I enjoy going to the grocery store but #twokids. 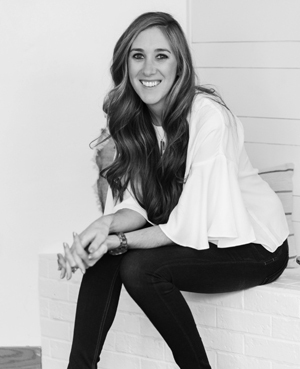 It’s not fun and nearly impossible if I try and take us all so I’m left trying to go when someone can watch the kids – or the much simpler solution is to just buy them online and get them delivered. I only did this for the first time recently and it was a total game changer. It’s not available in all areas but our local store started offering it this year and it’s been such a huge help when I just can’t get there myself. The pick up option is also another great way to get your groceries without even getting out of the car. So if I do have to bring the kiddos with me, it’s a much more pleasant experience. We all want coffee shop lattes every morning in the comfort of our own home right? At least I do. The thing that makes those drinks so yummy is the frothy, delicious milk on top. And while milk frothers aren’t crazy expensive, there’s a cheaper way. Shake it! Just pour your milk into a container with a sealed lid (I use a mason jar) and shake it for about 30 seconds or until the milk has doubled in size. Then just pop it into the microwave for 30 seconds and pour it on top of your coffee. Now you can pretend you’re at your favorite coffee shop sipping your favorite latte. I have to thank my parents for this tip. When we got our new stove last year, it was so hard to keep the cooktop surface clean. Using a cleaning solution will only get so much off and sometimes you need something more for those crusty, stubborn food stains. Using a glass safe scraper makes things SO much easier and gets all that hardened food off so quickly and so easily. It’s kept our stove looking brand new since the day we got it. In an effort to be more healthy with what we put in our bodies and about the products we bring into our home, I’ve been slowly making change around our house. This Bee’s Wrap is one of those changes and it’s another thing I can feel good about and makes my life easier at the same time. No matter what type of plastic wrap I used to buy, I would struggle with ripping off a clean cut piece and get so frustrated with the packaging. 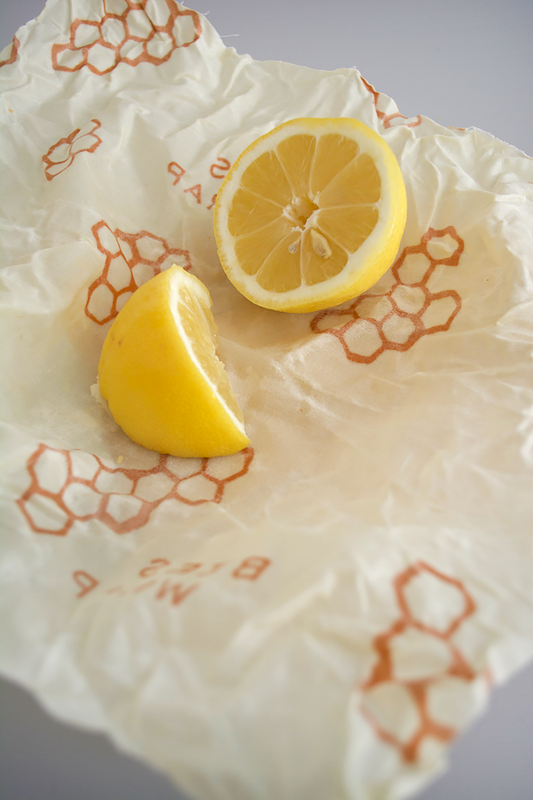 This all natural Bee’s Wrap comes in pre-cut sizes so all you have to do is grab a piece and wrap up your food and toss it in the fridge. 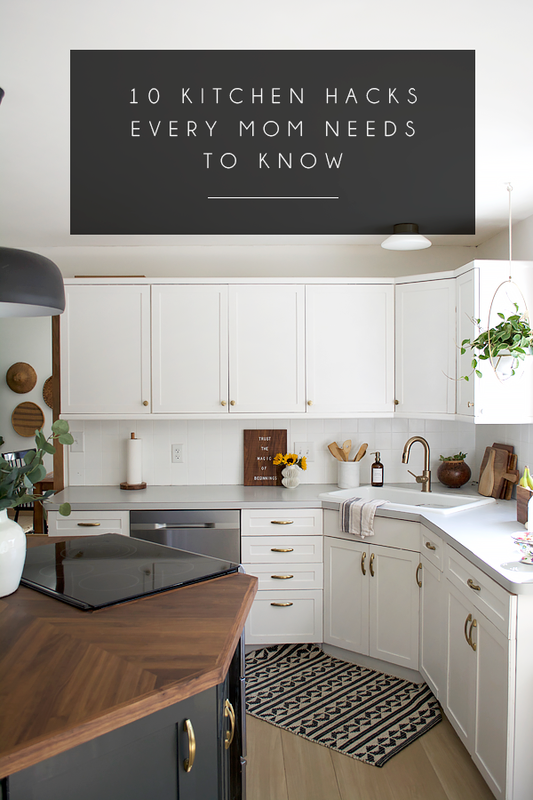 I by no means have it all together, but these little tips and tricks in the kitchen really do help make my life easier and I hope they’ll do the same for you! I’d love to hear if you have any hacks that you live by. Tell me in the comments below! Now through the month of April, receive $1 off Cascade pure essentials item (bag or tub) using the Meijer’s mPerks App. Bags are currently available and tubs will become available starting April 14! Also in honor of Earth Day, Meijer is offering buy one, get one 30% off all pure essentials during from 4/14-4/20 available at checkout. Why not hacks for a “parent” versus “mom”? Great read, some really helpful suggestions!! Excited to put them to use!